If yesterday’s L&D was about instructor-led classes and web-based e-learning platforms, today’s workforce increasingly demands learning that’s engaging, personalised, mobile, and immersive. 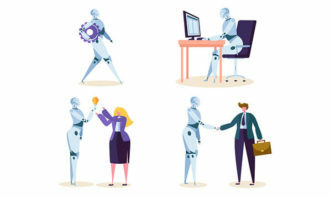 It’s no longer about L&D teams creating formal training courses, but blending a range of formal and informal learning experiences such as in-person training, mobile online learning, social discussion forums, or even virtual reality (VR). To help L&D professionals shape a next-generation learning environment, Udemy for Business took a deep dive into the profile of the modern online learner based on its platform of 13 million students to distill key learning trends and what to expect in 2017. 70% of modern learners rely on search engines like Google and 50-60% access online courses for knowledge, so it’s not surprising that today’s workforce relies less on traditional L&D training. 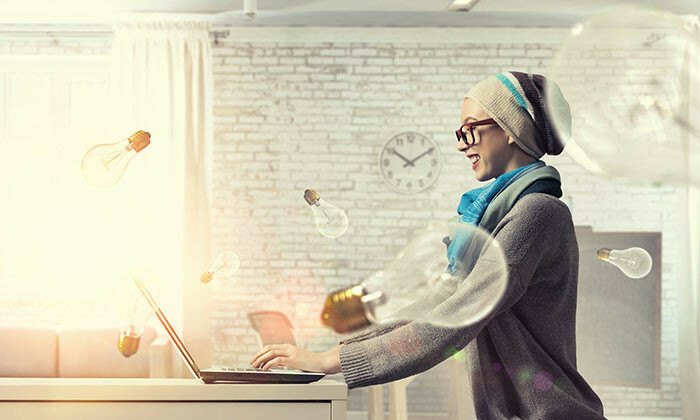 Millennials account for more than one in three US workers today and have surpassed Generation X in 2015 as the largest segment of the workforce, according to the Pew Research Center. Millennials, aged 21-34, comprise the latgest online learners at 48%, followed by Generation X, aged 35-54, at 39%. Gen Z (aged 18-20) and Baby Boomers (aged 55+) collectively comprise 13%. People in entry to mid-level jobs are more likely to be bored (46%) at work than those at senior levels. More women (48%) are bored at work than men (39%). Millennials want to learn software programming, mobile apps, web development, and game design online. 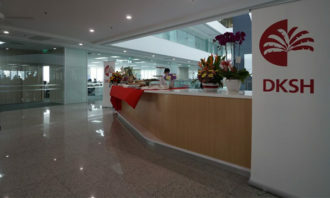 They are also focused on nurturing their business leadership skills. On the other hand, Generation X is busy keeping up to date by acquiring skills like digital marketing or data science. Mobile video traffic accounted for over half of the total mobile data traffic in 2015 (55%), more than social networking, web browsing, or audio. And mobile video is expected to keep on climbing to account for over 60% of mobile data traffic in 2018. To be mobile or not? It depends on what you’re learning. 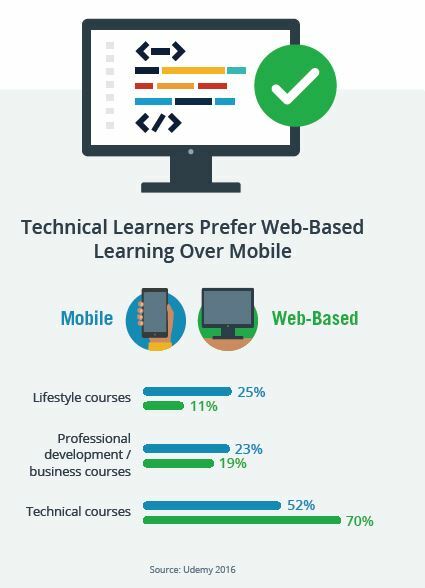 Technical courses like IT, software programming, and web development are more likely to be consumed on personal computers via the web. This is due to the need for a larger screen and keyboard for hands-on coding practice. In contrast, more lecture-based videos like marketing and management or fun lifestyle topics like meditation and cooking are more often accessed via smartphones when learners might be on the subway, in the kitchen, or on the beach. Wednesday is the most popular time to learn at work – with 3pm as the most popular time of day where learners will engage with some form of training. 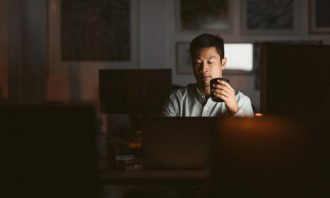 Those taking courses in IT, software programming, and web development have a second peak time at 10pm, preferring to burn the midnight oil when it comes to learning. Mobile learning is popular on the morning commute 6am-9am for all learners, peaking at 9:00am, and tapers off during work hours and the evening commute. 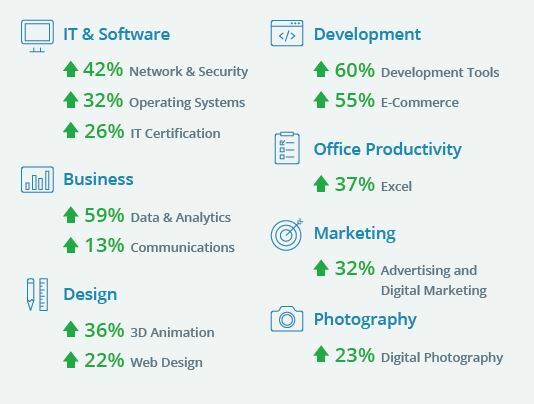 While IT, software development, and office productivity continue to top the list of popular workplace courses in 2016, new learning trends are emerging that are worth watching. Amendments to the Employment Act means better protection for some 450,000 workers when it comes to unfair dismissal and unpaid ove..